Kids around the world are emulating Seinfeld’s George Costanza and The Big Bang Theory’sHoward Walowitz by settling into the parental nest for the long haul, say international researchers. A University of Melbourne literature review, published in the journal Maturitas, shows an increasing trend of young adults staying at home well into their adulthood. And just as many return years later, with their emotional baggage – and often their own children – in tow. Yet, this changing dynamic in households across the world remains largely unexplored. Associate Professor Cassandra Szoeke and Katherine Burn, from the University of Melbourne’s Faculty of Medicine, Dentistry and Health Sciences, analysed 20 studies involving 20 million people worldwide using data from PubMed and PsycInfo and professional archives gathered by the Healthy Women’s Ageing Project. They looked at every significant study undertaken into “failure to launch” kids who never left the nest and the “boomerang kids” who have returned. A growing number of young adults continue to live with their parents or return to the home after leaving. There is no single reason driving the shift. The phenomenon is influenced by complex financial, social and emotional factors for both parents and children. Living with parents is often beneficial for adult children, but can affect their sense of independence. Parents report financial and emotional negatives when kids return to the nest. It’s important for parents and kids to talk about the expectations of the living arrangement, otherwise conflict arises. So why do some kids fail to launch? Co-investigator Katherine Burn is a psychologist who is completing her PhD thesis on social engagement and ageing. She says children often fail to launch because they want the ongoing security of their home life when their lives change. “Starting university, saving for a house, or getting a new job can encourage people to stay at home longer and of course it’s a beneficial arrangement for them,” Ms Burn says. "For young adults who are grappling with financial and domestic independence, the family home is a safe haven." Associate Professor Szoeke says it’s well known that in Europe, low-income and unemployment make people more likely to fail to launch. “But there are growing reports that this is happening everywhere in the Western world,” she says. “In the United States and Canada and here in Australia, there has been an increase in the number of young adults living at home. “Interestingly, the research we examined showed wealthier parents and those who are still married are more likely to have children living at home for longer. She says parents in poor health were much less likely to have children living with them, unless the child was a carer. As for the boomerangs – it’s those unpleasant, unplanned events like unemployment or divorce that often prompt a return home. They are more likely to be in financial dire straits and sometimes come back with children of their own. "The return of a child to the family home can herald a decline in wellbeing for parents, as poorly defined roles and the desire for independence fuels conflict." “Many parents talk about the lack of privacy and the impact on their social lives, particularly if the returned son or daughter has kids of their own,” Associate Professor Szoeke says. The old-fashioned notion that “empty nest” mothers pine for their departed children as they take flight into adulthood is not entirely true. “Professor Lorraine Dennerstein, founder of the Melbourne Women’s Midlife Health Project, studied this back in the 1990s. She found that an empty nest actually leads to a significant increase in positive mood and wellbeing for parents, but only once the last child has left home,” Associate Professor Szoeke says. 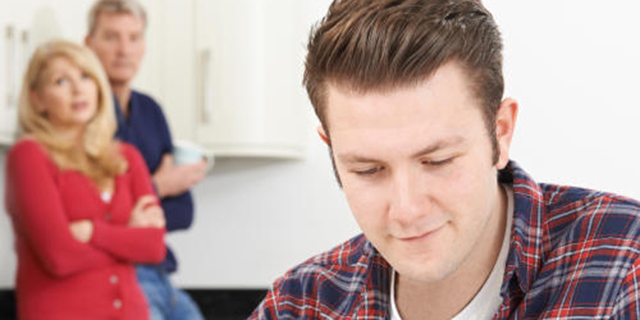 The return home is not an ideal situation for adult children, who suffer a lack of independence while they struggle to maintain their role as an adult. But it’s the parents, in particular, who complain about a drain on their emotions and bank balances, as household tensions flare. Ms Burns says boomerang children rarely make contributions to the household. “Even when children do make financial contributions, the parents remain out of pocket,” Ms Burn says. “This can often cause resentment and conflict. After all, there goes the caravan for retirement or that long-awaited European holiday. Many adult children, especially sons, report they enjoy the “domestic value” of living at home, particularly the services provided by their mothers, such as cooking, cleaning and laundry. But it’s not all bad news. Sometimes having the kids at home for longer is a positive experience for everyone. The key to success is open communication and defining relationship and household roles early on, Associate Professor Szoeke says. And several studies show that providing support to young adult children increases the likelihood of reciprocation later. “Children who leave home later are more likely to have regular contact and provide help to their parents. So there are a lot of benefits to having children stay home longer. “We see negative experiences when roles and expectations mismatch. If you look at cultures where it’s usual to have co-residence of adult children and parents, those conflicts don’t exist. Making it work involves clearly defining the roles and expectations of cohabitation, as things change as we age. “Every individual and every family is so different there is no one rule that fits all. What we do know is that families need to lay some ground rules and discuss how it’s going to work at the very start of the arrangement,’’ Associate Professor Szoeke says. “Because we’re not tackling it directly and we’re thinking of it as purely a byproduct of circumstance, all of the financial, social and conflict issues arise. This phenomenon is a new area for social research. Associate Professor Szoeke says she’d like to see a lot more attention paid to the boomerang and failure to launch generations. "This is something that’s happening worldwide and we’ve never talked about it." “An article like ours summarising all the evidence hasn’t been written before. Not enough has been done in this space. This is an active, increasing, part of our family lives. This article first appeared in Pursuit. Click here to view the original.